I know, I’ve been silent for a while, but I needed it. In the upcoming weeks I will slowly get back to normal rhythms, to blog, recipes and stories. When the time comes, I will tell you how this unusual, homely, thoughtful August has been a month of exploration, a month which has brought me where I am now, to understand better what I needed. I missed so much taking some time to read in the morning on the balcony with a cup of coffee and Noa curled at my feet, or the evening in my bed, leaning against a mountain of pillows. I missed listening to myself, to the people next to me, cooking for friends and family just for sheer pleasure. These days of rest have been refreshing like a glass of icy cold water, like a walk in the mountains during the hottest summer that men can recall. Last year Tommaso and I spent a few days in the Appennino Pistoiese to escape the heat wave which was chasing us right into our suffocating house. This is one of many remedies that the Tuscan people, especially those living in the cities, have to fight the summer heat. Just over half an hour from Pistoia and one hour from Florence and Lucca, here you enter into another world made of chestnut trees (remember the necci? 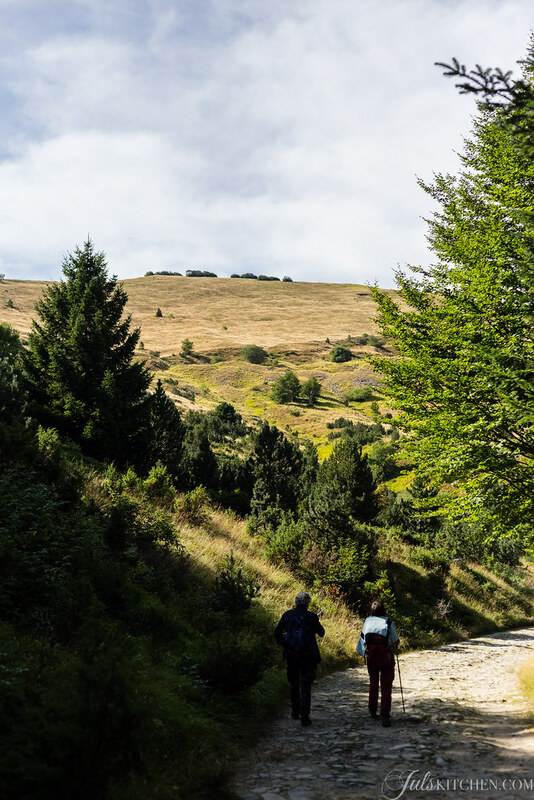 ), hiking trails, blueberry bushes and many medieval villages, like those of Popiglio, Piteglio, Sambuca, San Marcello, Cutigliano and Serra Pistoiese. 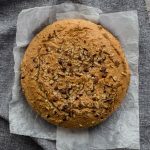 Today for our Ventura Tuscany tour through the use of nuts and dried fruit in traditional recipes, I’m sharing a humble cake, the almond cake of San Marcello Pistoiese. Slicing this cake, you’ll have the feeling to bump into an old fashioned cake, one of those cakes so dear to grandmothers that can be kept covered with a towel in the corner of a cupboard, on the kitchen table or on the top shelf of the pantry, away from stealth and greedy hands. 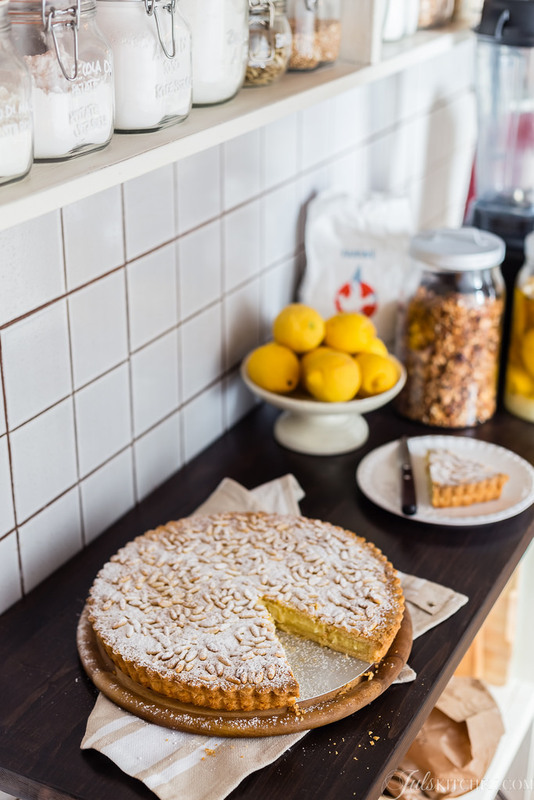 The almond cake of San Marcello Pistoiese is crumbly and dry, a breakfast cake which demands to be soaked in a cup of tea or coffee or to be spread with your favourite jam. It shines also after dinner. Clean away the crumbs from the tablecloth, place the cake in the middle, slice it and serve it with a glass of vinsanto or any other dessert wine. It has the bashful and rough character of the Appennino Pistoiese. Do not expect to be won over at first bite: this is a cake that needs time, it moves on the long run, but when it does, then it will never be enough. 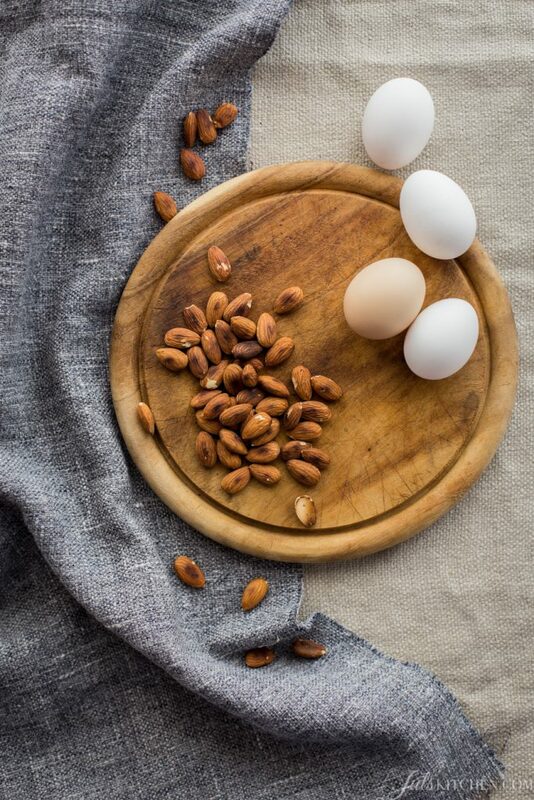 Cut a slice of cake, pick the toasted almonds from the surface and eat them right away, you’ll enjoy a first little moment of perfection. Then dunk the cake in a glass of sweet wine, just as you would do with the almond biscotti. The tipsy cake forgets humility and modesty, explodes and reveals its charming aromas: the lingering Strega liqueur, the aniseed, so traditional, the citrusy lemon zest and the toasted almonds. Eat the cake in small bites, a sweet heady pause among chats and confidences. 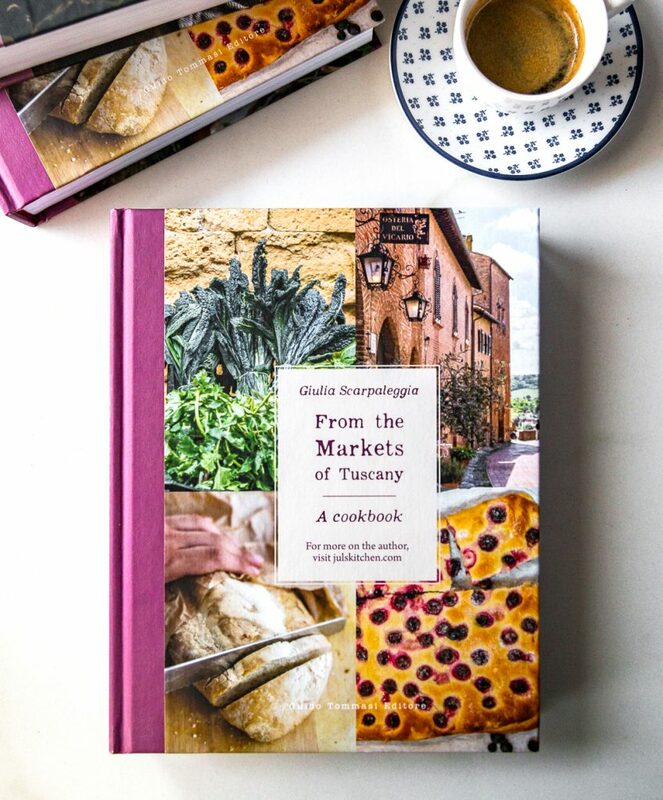 The recipe is adapted from Giovanni Righi Parenti’s La Cucina Toscana, one of the basic books to discover the real Tuscan cuisine. Toast almonds in a nonstick skillet over medium heat for a few minutes, until they begin to darken. Remove them from the heat, let them cool completely and then grind them in a mortar, or chop them finely with a knife. Set aside. Preheat the oven to 170°C (340°F - Gas mark 4). Beat eggs and sugar until light and fluffy. Add flour, baking powder, anise seeds, grated zest of one lemon, a pinch of salt and a tiny glass of liqueur Strega: stir until all the ingredients are incorporated in a crumbly dough. Add now the softened butter and mix until you'll have a thick sticky dough. Grease and flour a 25cm round pan, scrape the dough into the pan and level the surface with a spatula, then sprinkle with chopped almonds. Bake the cake for about an hour, or until golden and dry. Allow it to cool completely before slicing and enjoying it for breakfast or as an after meal treat. It keeps well for a few days wrapped in kitchen paper or in a clean towel if stored in a cool, dry place. * Strega liqueur is an Italian herbal liqueur produced since 1860 by the S. A. Distilleria Liquore Strega in Benevento, Campania. Read more about it here. You can substitute the Strega with rum or another herbal liqueur. This would be a winner with a cup of Earl Grey, we should try it when you come! Hi Juls. I love traditional recipes, especially ones that have been handed down through the years. My family is originally from Calabria. My mother and aunts always made a ‘cookie’ from a few simple ingredients – one of them being vino cotto. Not easy to find or make, so sometimes I substitute grape jelly. In our family we always laugh as the ‘gravioli’ as we call them are so brutto (ugly) but delicious and a reminder of time spent cooking together as a family. You are so right, Lisa! 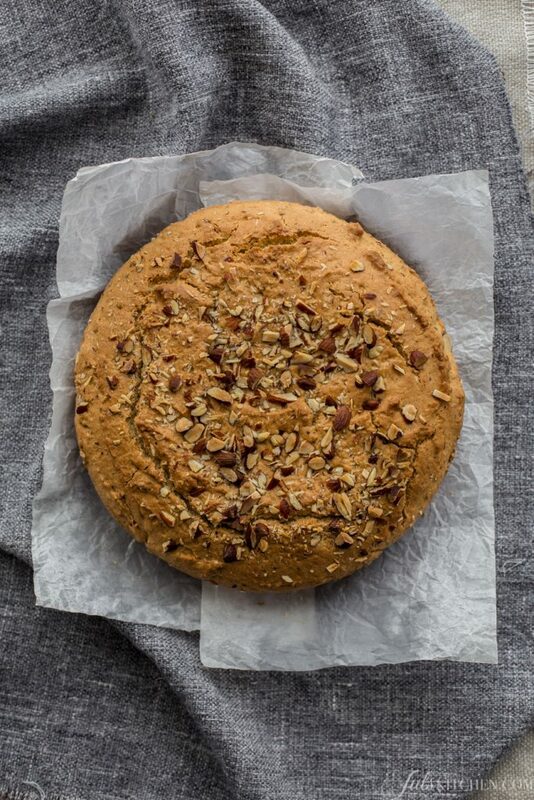 ugly and delicious is such a common thing, and this cake has certainly that rustic feeling! I love the look and sound of this cake. It seems perfect as we move closer to fall, and I can’t wait to try it. There is not much better than a simple, rustic cake. a question for you Jules: I don;t have any Strega. I do have some nocino, and a few different amari that are herbal. Would you recommend one of these, or I see also you said rum might be used. I wondered which you think would be the best fit? Ciao Gabrielle, nocino I fear would be too bitter. Use rum which works for sure, as it was one of the listed liqueurs to use in the recipe! This is the traditional type of cake that my family loves! I think I willies some of the black anise seeds from Sila, Calabria when I prepare it. I just recently discovered how goof anise seeds can be in baking, now I love their old fashioned flavour! Awwww! It took us a few months to redesign it, well, I just said what I would have liked, Tommy did the magic! previous post: It’s my birthday: let’s celebrate!